Active people ask more from their bodies. You can get most of the nutrition you need through a smart diet. But for the rest, a multivitamin can be one of the most important supplements in your stack. If you're a lifter, an athlete, or someone with an active job, you probably need more nutrients than your average couch potato. And no, I'm not just talking about the macronutrients of protein, carbs, and fats. You can get most if not all of your daily needs of those through a good diet. Where you might not be getting enough is in the realm of micronutrients you need. That's where multivitamins come in. A good multivitamin usually contains a wide range of micronutrients including B vitamins, vitamins C, A, D, E, and K, and minerals such as potassium, iodine, calcium, magnesium, and iron. Even if you're absolutely meticulous about meal prepping, you still may need some help reaching your micronutrient needs in these categories. Here's how a multivitamin might help, and how to get the most out of the one you take. Rigorous exercise is good for you, but it also demands more from your body. When you're active, your body need micronutrients for fluid balance, to maintain a healthy metabolism, and to build and repair muscle. The act of sweating alone can deplete your stores of essential nutrients, including calcium, potassium, sodium, zinc, and magnesium. Low levels of these minerals can lead to cramps, fatigue, dizziness, and low blood pressure. It can also negatively impact your athletic performance pretty quickly. Nutrients such as B vitamins, copper, and iron help your body maintain the level of metabolism your body requires to support intensive exercise. And when you increase the frequency or volume of your exercise, you're increasing your body's needs for these micronutrients. Hopefully, if you're an active person, you're paying attention to your diet. You're eating both a wide variety and a high volume of leafy greens, lots of different fruits, and plenty of other veggies. You're consuming enough protein and just the right level of carbs and fats. But if you're not (or maybe you're not sure), there's a good chance you're missing out on some crucial vitamins or minerals. If you're always eating the exact same foods (chicken and broccoli, anyone? ), you're always getting the exact same nutrients—and possibly missing out on others. A multivitamin may be just the thing you need to keep your body in balance. That's not to say that you can make up for a poor or limited diet just by taking a multi. A vitamin is not food! The foundation of any active person's life needs to be a well-balanced meal program. And then there's dieting. If, as part of weight loss or contest prep, you start reducing your food intake, you may also be reducing your nutrient intake. Lack of zinc, iron, and specific vitamins can lead to fatigue, trouble concentrating, and higher susceptibility to illness. No matter why you're limiting calories, it's up to you to make sure your diet doesn't leave important gaps in your nutrition. If you don't eat animal protein, you might want to take a multivitamin with the RDA (Recommended Daily Allowance) of vitamin B-12, zinc, and iron. If you're on a lactose-free diet, look for multivitamins with calcium, phosphorous, vitamin D, and potassium. If you are thinking about taking a multivitamin, there are a few guidelines to consider. You can talk to well-informed friends, nutritionists, or a pharmacist to get a recommendation. You can just pick a multivitamin off the shelf and see how it works. Or you could work with a medical professional to help you identify exactly which vitamins and minerals you may lack. Multivitamins nowadays come in all shapes and sizes. For example, prenatal multis contain more folate to match the specific needs of pregnancy. Some multis designed just for women contain extra iron and calcium. 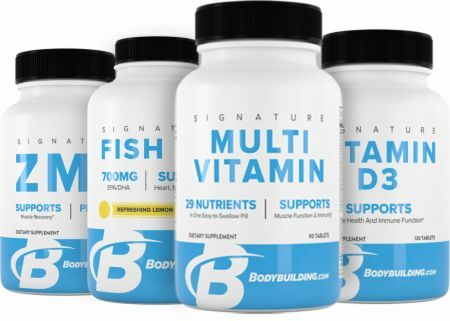 To get the most benefit, find a multivitamin that's tailored to your individual needs. Read the label to avoid any possible allergens, sensitivities, or restrictions. In most cases, you only need to take your multivitamin once a day. Try pairing it with a fat-containing meal to maximize absorbency. If you take a water-soluble multi, your body doesn't store excess nutrients and can expel them though your urine. Even so, continuous overconsumption can lead to nerve issues, kidney stones, and more. Your body does store fat-soluble vitamins, including vitamins A, K, and E. Excess amounts of these vitamins—and of iron, sodium, and calcium—can build up to toxic levels and wreak havoc on your body, particularly your liver. By making sure the multivitamin contains micronutrients at or close to 100 percent of the RDA, you can avoid uncommon issues caused by nutrient overconsumption and toxicity. If you are concerned about possible toxicity, talk with a doctor or medical professional to make sure you take the right amount of the right multivitamin. If you're an active person, your body will thank you for taking care of its micronutrient needs. Just be sure you do it safely. Van der Beek, E. J. (1985). Vitamins and endurance training food for running or faddish claims? Sports Medicine, 2(3), 175-197. Catherine Saenz is a doctoral student at The Ohio State University where her focus is on exercise and nutritional sciences.